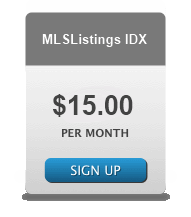 Each MLSListings IDX plan comes with one MLSListings IDX and has no set-up fee. There’s no long-term commitment. You simply pay month-by-month and can change your plan or cancel at any time. NOTE: You may be asked to login to the MLSListings system. This enables instant approval of your IDX license and expedited account set up.